Someone famous once said, or sung, “Cleveland Rocks!” MCFTech has grown into a truly global company with resources all over the world. However, our roots are still in Cleveland where we got our start, and we love to give back to the city to keep Cleveland rocking harder than ever. The forum promotes innovation and excellence while helping students develop entrepreneurial, artistic, math, science, and business awareness skills, all while giving students exposure to multiple businesses and industries. 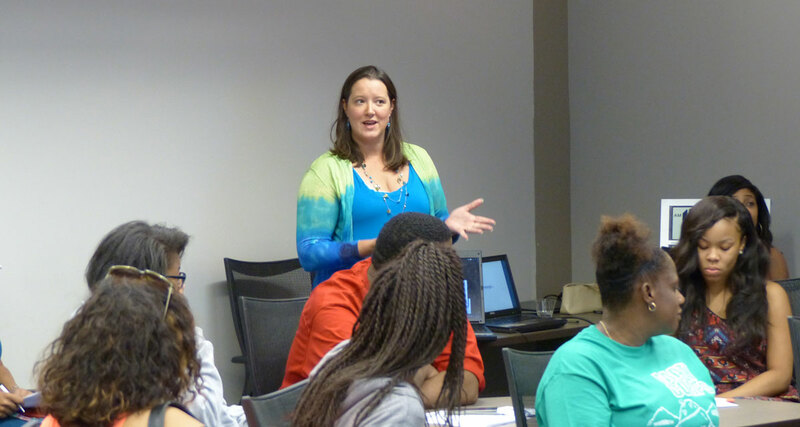 August 22, 2015, Cleveland, OH – MCFTech’s Kara Erdmann introduces herself and MCFTech to students at this year’s Youth Innovation Forum. This year’s volunteers also include an IT Project Manager from Eaton Corporation, a graduate student currently working his way through medical school, a manager from an IT staffing company, and a retired Quality Control Engineer from Swagelok. The Youth Innovation forum has seen great success in the past, with all students graduating from high school and attending college. “I am excited to have MCFTech as a sponsor this year as well as having some of its employees actually working with our youth to develop product concepts that we hope to eventually get funded and take to market to generate funds for the program and scholarships for the youth,” stated Connie Atkins, co-founder of the forum and Executive Director Emeritus of CAAO. For more information on the Youth Innovation Forum, or to donate to help keep the cost to the children as low as possible, please visit their website. CAAO is an umbrella consulting organization for the black professional organizations of Northeast Ohio. CAAO serves as a conduit and referral source to existing resources for entrepreneurial development, professional development, and leadership empowerment for its member organizations and their members. CAAO’s member organizations communicate with over 30,000 black professionals on a regular basis. Thus, CAAO serves as a dynamic link to the “New Economy” for black professionals in Northeast Ohio.